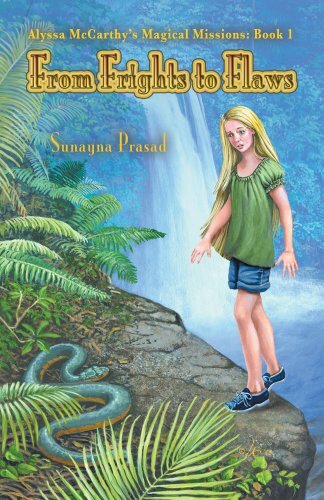 From Frights to Flaws, by Sunayna Prasad, is the first in the author’s Magical Missions series and follows the plight of Alyssa McCarthy as she discovers a magical world complete with a talking marble statue and fantastic creatures bent on saving her from a newly-discovered nemesis. Alyssa is a twelve-year-old girl living with her cousin and uncle–a man who cares for her but provides a highly regimented life of homeschooling, chores, and virtual seclusion from the outside world. When Alyssa begins to find peculiar notes around their home addressed to her, she strives to make herself noticed and validated by her uncle. Her life, and the lives of her family and friends, go from humdrum to fantastically frightening in a matter of moments. As the first book in a series of fantasy stories, From Frights to Flaws has the potential to be a memorable read. However, as a teacher who often uses literature from all genres in my classroom, I can’t help but notice some issues with character and plot development. On several occasions throughout the reading, I felt that unique situations were brought to light too quickly without sufficient background and build-up. The author is aiming at an audience who is still developing a schema as they read, especially in the fantasy genre. It is important to be as descriptive as possible to draw in readers with elaborate explanations. I feel those explanations are missing as the setting moves from the everyday to the land of mythical creatures and magical beings. The author takes for granted that the reader is able to follow quickly and make assumptions. I was struck early on in the reading with the similarities to the Harry Potter series by J.K. Rowling. Alyssa, a wonderfully written character, is thoroughly described in the initial chapters, but loses some of her uniqueness as the book progresses. The setting of the book is one of its more appealing aspects. The author has chosen to set Alyssa’s adventures in present times with references to tablets, iPhones, iPods and GPS navigation. This alone will attract a younger audience. The fantasy element interwoven with this modern-day setting makes for an appealing read for preteen readers. I was impressed with the growing number of fantastic creatures as the story line progressed. From dermaidens to the centidile and from Regulus, the marshakeet, to the ash-breathing adder, the author has laid out a long list of beings who can easily compete with those in any fantasy novel for preteens. Prasad has the base for a strong work of literature for young readers, but lacks some of the well-developed background and detail I would like to see in this particular genre. Sunayna Prasad has created a story that is enthralling in many ways.